Home › Accounting › (Four)tunately Nobody Was Hurt! A wave of panic hit me. My peaceful accounting life had been disrupted. I’m supposed to be in my cube at all times, I couldn’t possibly go golfing. The fact that I had never been golfing was much less of a concern to me than the fact that accountants like myself don’t get invited to do such things as golfing – if I went I would set a precedent that could destroy the very fabric of accounting and dis-spell the idea that accountants can actually be cool to hang out with from time to time. In a panic I replied, “Yes”, and immediately regretted it. I asked and, unfortunately, received permission to join my coworkers for golf and then, in a panic, rushed home to cry. Besides crying, I also changed clothes based on what I thought one should wear when one goes golfing. This was much easier that crying due to the fact that the typical golfer has the same amount of fashion sense as the typical (me) accountant. Properly dressed, and vacated of tears, I set off at a rushed pace to the golf course while, and I don’t condone such behavior in an accountant or a normal person, texting a friend of mine for tips on how to play golf. His advice: volunteer to drive the golf cart. Feeling much better about playing golf now that I had some friendly advice to work with, I walked up to the driving range where the others in foursome were waiting. As horrifying as this exchange was, it was the lone bright spot in a dark, dark day for the sport of golf. With clubs in hand we drove to the first tee. Relying solely on the experience I had received from watching golf on TV, I put the tee in the ground, put the ball on the tee and began to cry. Wiping the tears from my eyes just long enough to swing the club, I believe it was a putter, I was amazed at how far I could drive a lawn-size square of grass down the fairway. 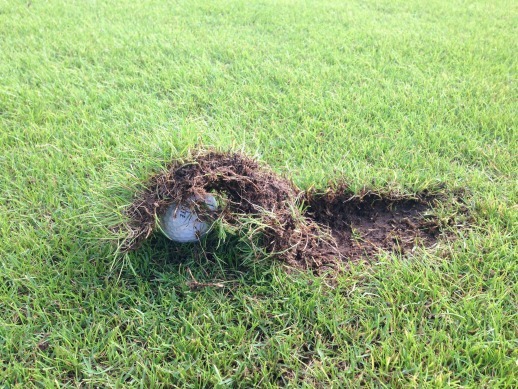 I was also amazed that this lawn-size piece of grass missed hitting the ball from the tee as badly as my club did. After turning the tee into a veritable sand trap, I finally hit the ball. It was a great feeling watching that little white ball roll off the tee for, what must have been, a three-foot shot. I only had 482 1/2 yards to go to get to the hole. I’m not sure when the rest of my foursome left me at the first hole but I was joined by several other groups of various sizes as I continued to put my way along the first hole. Some were kind and bought me a beer or two. Some were angry that I turned the first hole into a post-apocalyptic wasteland. Some skipped the hole entirely. After three hours, and the green finally in sight some 562 yards in the distance, I decided I should change clubs as I recalled seeing the pros do on occasion. I hit it somewhere that I was never able find. Without a ball now, I decided that I had two choices: I could give up and go home, or I could use a pine cone instead. The pine cone, it turns out, was much easier to hit. The downfall, however, was that the pine cone wasn’t very durable. After another three hours and 29 pine cones I finally putted the last pine cone on top of the hole. It was close enough. As I stumbled through the divots that now made up 98% of the first hole attempting to find the parking lot in the now pitch-dark night, I couldn’t help but feel a sense of pride for having finished what I had started. I didn’t give up. I didn’t let the lack of a golf ball stop me from moving forward towards my goal. I didn’t cause more than $1,000,000 worth of damage to the golf course. In the end, it was a nice to break out of the mold; doing something I wouldn’t normally do. Maybe next time I’ll make it through two holes.